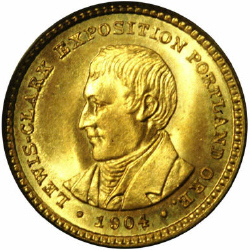 The Lewis & Clark Exposition heralded the issue of souvenir gold dollars dated 1904 and 1905 respectively. 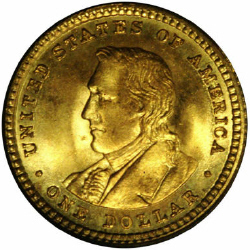 The design was crafted by Charles E. Barber, most famous for the U.S. Barber Coinage series, and consisted of a bust of each famous explorer on each side. 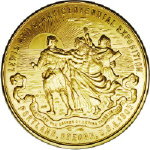 The coins financed the erection of a bronze memorial in Portland, Oregon for their famous Indian guide Sacagawea. 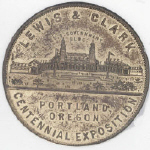 The Lewis & Clark Exposition was popular and also saw the issue of a 1/4 quarter gold dollar and 1/2 gold dollar token as well as a Centennial and Government Building medals. See pictures below. 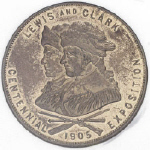 In May, 1804, Meriwether Lewis and William Clark set out on an expedition across the Louisiana Territory. 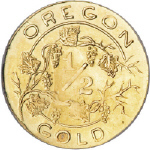 It was initiated by Thomas Jefferson after The Louisiana Purchase in 1803. Jefferson hoped they would discover a water route connecting the Columbia and Missouri rivers and that link would connect the Mississippi River with the Pacific Ocean, or so he imagined. 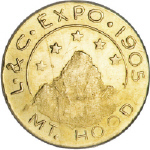 It was the first exploration sanctioned by the U.S. Government and the most meticulously and officially recorded expedition of its time. Lewis kept a journal on the animals, geography, fauna and the Native Americans they encountered. Sacagawea, and Indian guide, was assigned to help the expedition communicate with Indians and help navigate the mostly unknown territory. 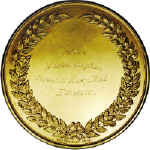 Although, the expedition failed to find a water link connecting the Pacific Ocean and Mississippi, it was successful in all other ways, creating a route for furthering American expansion, and providing maps and important information on the topography and geology, for other adventurous Americans to follow.